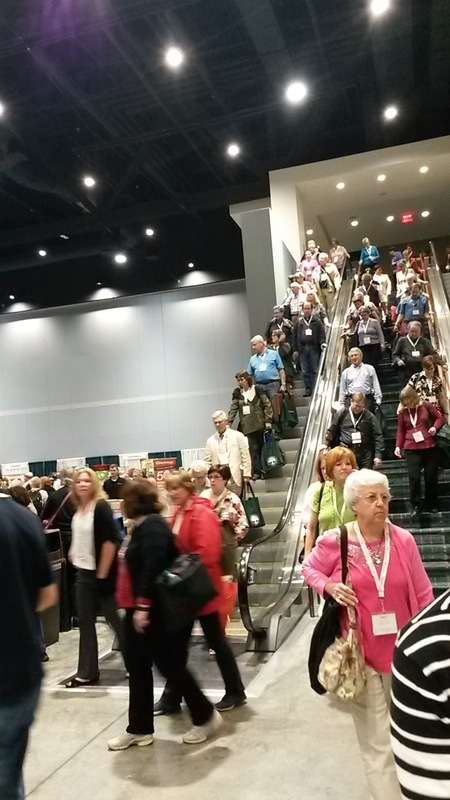 When the NGS conference wrapped on Saturday, I was exhausted – mentally and physically. Though, it’s the good kind of exhausted. (12) Interact with NGS and NCGS individuals, some of whom I’ve only previously interacted with via email, Facebook, Go-to-Webinar, etc. You want to tackle that brick wall yet again -- and probably with some new approach you learned about from others at the conference. In short, you realize the conference and the energy generated by the presenters and the participants has rejuvenated and invigorated your enthusiasm for genealogy and you cannot wait to get back to the detective work of discovering and documenting your family history. So, though some are ready to proclaim in-person genealogy conferences dead, I think the attendance numbers for NGS this year (not yet officially released) and the experience of John and many others, whether attending their first conference or their 30th speaks volumes that genealogy conferences are incredibly dynamic and invaluable to our community. Though I spend a lot of my time working alone, out of my office, researching long-ago dead people, it was fun to take a week and connect and re-connect with so many living people who share my passion about family history. As you consider whether to attend NGS 2018 or any other future conference, do keep in mind all the benefits that come from attending a conference, as shared by John, which goes well beyond the content shared via presentations! What is your favorite part of attending a conference? What pleasantly surprised you at the most recent conference you attended? What is/was the first thing you decided to do post conference as a direct result of attending a conference?